This guide was written by community member Andyman119. He's an Eligor main and loves to make good reads. Eligor does well against fighters who hit very very hard like Alexian and Cadenza because they allow him to maximize his payout on Aegis and Martial, or rely on not allowing him to get close, like Rukyuk and Khadath, as Eligor is fantastic at closing the gap. Eligor has poor match-ups with highly disruptive characters like Lixis, and opponents that have easy access to Ignore Stun Guard, such as Shektur and Kallistar. Eligor is deceptively simple character. He can go toe to toe with most heavyweights and has a lot of hit confirm. Access to ludicrous amounts of stun guard means he’ll rarely get stunned before he delivers his big payout attacks. Spend your vengeance. It does you no good just sitting in your pool, so spend it. Nearly all of your pairs effectively punish your opponent for attacking first, so stun guard is both useful and easy to get. Set up favorable 50/50s. Eligor’s biggest strength is his ability to counter nearly all reasonable attacks. Counter is one of the best 50/50 styles in the game, and aegis can make your opponent second guess their most advantageous attack pairs and play sub-optimally, use that opportunity to punish them. Watch the Dodges. The worst thing that can happen for Eligor is for him not to get hit after anteing a lot of Vengeance. Not only might he miss, but his abilities will not activate. If Eligor has no resources to start a beat, he’ll probably have to lose a beat to get those resources back. Brutally efficient Unique Base makes trading fantastic. Has to take a lot of damage to function correctly. On-Hit Stuns make him very sad. Eligor has good matcups against a lot of the cast. Heavies have to play very carefully against him. He is the archetypal counterattacker, he pairs well with disruptors and brawlers, but can fit comfortably on most teams. 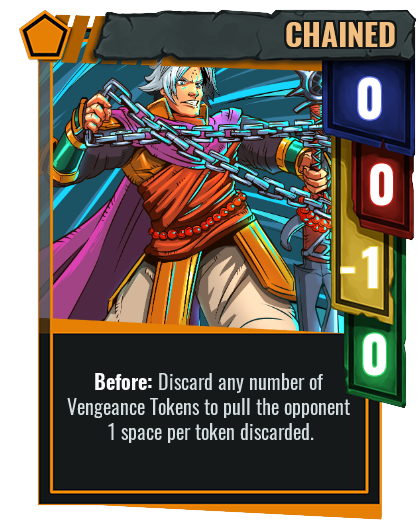 Eligor’s Vengeance Tokens, like most tokens, fuel his abilities, but the stun guard is nothing to sneeze at. Giving shot extra stun guard makes it trade evenly with any base that can hit it at range 2+. Eligor’s ability to gain stun immunity also makes on-hit stun such as Karin’s Feral fizzle, giving him some counterplay versus ignore stun guard if he’s willing to go all-in. Tokens are usually plentiful, as trading will usually have you end up back at 4-5 tokens by the end of the beat. Eligor’s Unique Ability does require him to take damage however, so don’t let your life get into the range where you can be 1-shotted. Retribution is one of Eligor’s best styles. 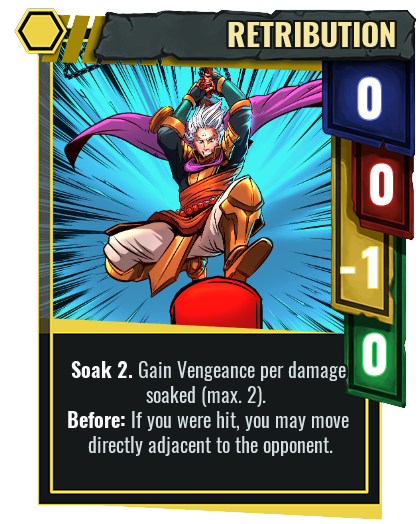 2 Soak is very powerful and it’s your go-to style to punish your opponent’s long-range pairs. If you find yourself out of position, retribution is a good way to get back into melee where your best attacks work. Gaining back Vengeance without taking damage is also incredibly valuable in the late-game, when life can be scarce for a counter attacker like Eligor. Retribution Aegis is one of Eligor’s best pairs, providing a maximum of 7 soak and stun immunity, while always trading up, even if your opponent does manage to punch through, they’ll have to hurt themselves badly to do something about that. This is your big payout style. Paired with shot it can muster 9 power with a Force Gauge ante, and with a 1-5 range to boot! It’s -1 priority makes you more likely to go second, which is perfect for this style. No inherent stun guard does mean you will have to spend some Vengeance to make good use of this powerful style, but the results are well worth it. Martial’s +0-1 range also lets attacks with normally poor hit confirm, like strike, become more useful. This is Eligor’s fastest style at a somewhat pathetic 0 priority, but it’s also the one least dependant on his counterattacking style. 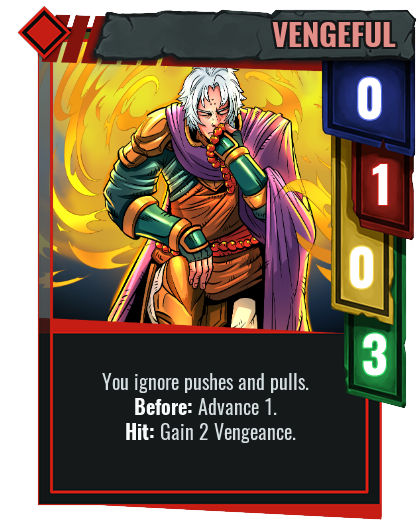 The Advance 1 on Vengeful lets you maintain the corner positioning which Eligor adores while using Dodge, and makes grasps and drives his options for if he needs to attack moderately fast. If you do land a hit with Vengeful, you are rewarded with 2 Vengeance. This is one of the few styles Eligor actually WANTS to hit first with! Of course, he can still trade decently with it if he has to, using its +1 power to his advantage, and its stun guard 3 will allow him to strike back if he is hit first. Counter is Eligor’s slowest style, far from hindering him, this helps him go second, and the ability rewards successful hard reads. It is most effective in situation where your opponent only has one move which can hit you. It can also be used to close the distance to your opponent, where it’s +1 power can trade positively with many pairs. Take the following example: Eligor is sitting at range 1, and thinks his opponent will play a burst. The natural thing to do might be to play a drive, however a drive will lose to a strike. This is where Counter shows its true colors as the ultimate 50/50 style. Eligor can play Counter Strike. If the opponent plays a strike, they will be stunned, and Eligor will hit them for 5 damage. If they play a burst that has more than 1 priority, they’ll strike first, and allow eligor to close in and punish them. If they play a burst with 1 priority they will clash, and Counter is a fantastic style during clashes, for the same reasons it’s fantastic during 50/50s. Eligor’s last style is a weird one, but very powerful in terms of positioning. With it’s downright mediocre stats, it’s nothing to get excited over, and will often trade down. So why play it? Because of it’s Before Activating trigger. 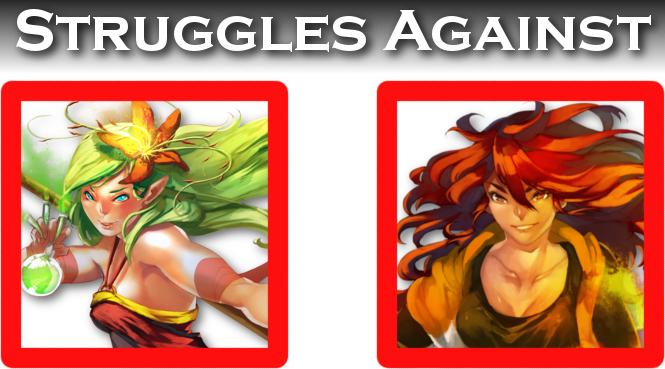 These triggers allows you to pull your opponent close, which is always good news for Eligor. A priority of -1 means it’s typically going to be second, so don’t go getting any ideas of pulling an opponent into range and then stunning them before they get a hit in, that’s not how Eligor rolls. 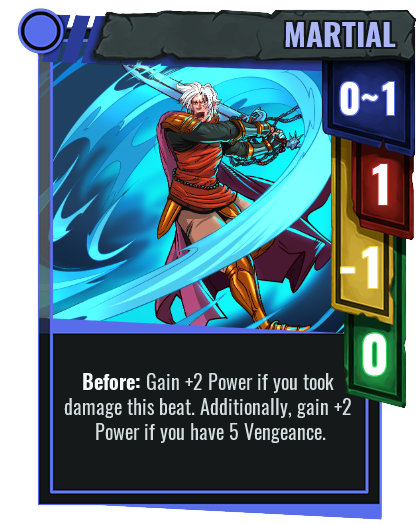 Typically, you’ll be taking a hit and using your freshly earned vengeance to pull the opponent closer, trading life for better positioning for the next beat. You can pull your opponent back into the corner when they try to dodge out, or dodge into the corner and pull your opponent nice and close to set up an inescapable Martial Shot. Chained is a great style to pair with Dodge. Eligor’s Unique Base, this one has the unique benefit of never trading down! As long as it hits, this base will always hit for as much damage as your opponent has, not counting bonuses. It’s range of 1 makes Retribution a natural pair with it, but nearly any style pairs well with this monster of a Unique Base. 0 priority ensures it will almost always go second, so it is vulnerable to everything strike is vulnerable to. Fortunately, Retribution, Chained and Counter all solve it’s hit confirm problem. A word of warning however, you do not want to take 0 damage while using this base, as it will leave you with no tokens to use on the following beat. While the Force Special Action plays an important role in generating Force, it finds some use as yet another "fast" style for Eligor. Giving Eligor access to another Priority Neutral attack can prove to be useful for certain life or death situations. This is the finisher you want to activate against heavyweights and those with huge, close range attacks. This finisher will completely stop you from losing the game that beat, and against a less careful opponent, will usually win you the game if it connects. Remember to ante enough Vengeance that you don’t get stunned. This finisher is a finisher for setting up the next beat’s execution. It’s used when you’re way out of position, and need to close the gap. Range 3-6 is vulnerable if your opponent gets inside of it however, and 4 damage could well not stun your opponent and leave you vulnerable to a counterattack that kills you. Your opponent doesn’t have an out if they let this connect except killing you before you kill them however, so if it connects, you’re in good shape.